A modern take on a Filipino stew, this SoCal Pork Caldera is hearty, flavorful and versatile. Some of today’s best menu innovations come from a simple reframing of a familiar idea. The creativity behind dishes like chicken and waffles drives home that point, where chefs are retooling that classic to make it fit their concepts. Why bother? The answer is pretty clear to foodservice professionals: modern upgrades energize menus. The challenge is, as always, finding the flavor pathway that leads to the best dish—the one that’s craveable and helps a brand’s positioning in today’s competitive landscape. Commodity boards devote a lot of their resources to helping solve this challenge. We tapped a number of them to give us their best ideas that showcase creative strategies in this realm. Combine comfort and convenience with a pinch of nostalgia in this mash-up of Pop-Tarts and shepherd’s pie. The Shepherd’s Pie Tart at Ted’s Bulletin in Washington, D.C., can be prepared with ground beef or lamb sautéed with classic shepherd’s pie vegetables such as onions, carrots and peas. The pie crust envelops the meat mixture to create visually appealing, tasty tarts, which are then baked and topped with mashed potatoes. “This savory tart takes pie crust in a whole new direction, from a dessert or breakfast treat to a handheld light lunch,” says Don Odiorne, VP foodservice for the Idaho Potato Commission. “What I love about the Ted’s Bulletin execution is that it can be prepared in off-hours or well before a lunch or dinner shift, giving operators the flexibility to simply heat in the oven when ordered.” The dish also presents the potential for adaptability in that the options for fillings between two layers of pastry are infinite. 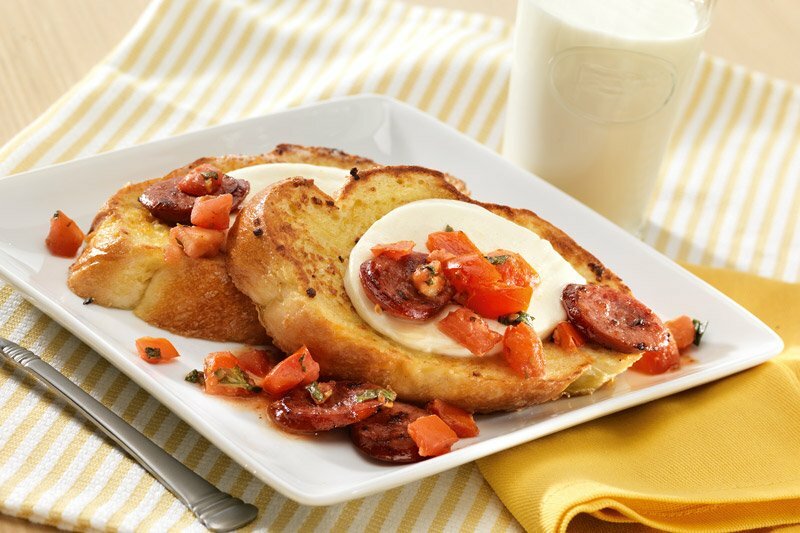 Though traditionally prepared sweet, this Savory French Toast Sandwich features shallot, smoked sausage, bruschetta-style tomatoes and slices of Wisconsin fresh mozzarella. The egg-dipped and lightly pan-fried slices of Italian bread create the base for the savory toppings, taking the concept of the classic French toast to another level. In fact, the flip from sweet to savory opens a world of possibilities for customization. Additionally, operators can tap into the continuing trend of all-day breakfast and brunch, notes Rachel Kerr, director of events and public relations at the Wisconsin Milk Marketing Board. “This dish gives operators a way to extend their breakfast offerings with a flavorful item that’s suitable for brunch, lunch or even dinner,” she says. From the Nov/Dec 2017 issue of Flavor & the Menu magazine. Read the full issue online or check if you qualify for a free print subscription.